More specifically, this means that the host ID specified in the license file is not the host ID of the computer. If you are using an Individual license, this may also indicate that the login name specified in the license file does not match the logged-in user account. How do I find my Login Name in order to activate my license? The Designated Computer license option only allows one account on a computer to run MATLAB at a time. If you are using a Designated Computer license and have already confirmed that your host ID is correct, then there is probably an instance of MATLAB running under a different user account on this machine. To test this, log out any other users on this machine. Be sure to check with your colleague to make sure that none of them have unsaved worked open on those other accounts before logging them out. i keep getting this error as well my company recently renamed/merged the domains, could this cause it? if so does anyone know of a fix for this? I learnt (the hard way) that changing a partition size also changes the Host ID. ok, i undestand why i can't run matlab on my linux machine. I have an SNU license and my username on the machine doesn't match the license file. What should i do to correct this? Hi, I am using a Dual boot laptop with Windows 8.1 and Ubuntu 14.04 and installed student version matlab 2015a in windows.Every time after using ubuntu and logging back on windows, starting matlab throws me a licensing error. i reactivated it two times. when i am checking for host id,it is showing that i have multiple host id's .So please let me know how to solve this problem. MATLAB activation is usually smart enough to detect when a computer is dual-booting, but depending on your machine configuration it may think each OS is two different machines. I get this error with the student license on Windows, i need to work on a family computer and it doesn't recognise the name in my license. Please help! I would recommend you reactivate MATLAB to your normal user account by running the "activate_matlab.sh" script in the /bin/ directory of your MATLAB installation directory, and providing your standard username when prompted. I fixed this error on my PC be re-running the activation tool (in your Windows Apps menu). When it asks for your Windows user name, be sure to give it your Windows user name, i.e. on the PC you're using right now, who are you logged in as? If this doesn't match it's going to kick you out when you launch MatLab. I installed it on my Mac Book Pro and I get the same error. I don't see my activation tool anymore but I have the same problem. can you help me? Hi guys, I have solved this problem on my laptop. My Matlab license is from my uni and this software requires a username( u have to use Matlab under this unsername's account). So I changed the name of my administor account. The ridiculous thing is that even u have changed the name(showed in start menu), the username is still the administor! A easy way to check is to open the task manager and click account on the top side. So just creat a new account whose name is same as u typed in Matlab, then it goes to work. +1 for gjh van erp. While reactivating the licence using the activate_matlab script works on my Linux machine, I still get the same error message every time I reboot the computer, and I have to reactivate the licence again. Does someone know of a way around this issue? Hi Mihail! I am having the same problem now on Ubuntu, after having had MATLAB working perfectly for a couple of months (i.e., the error message appeared only after ~ 50 days after having installed MATLAB). Did you find out any solution for the issue? Veronika, is it possible that your ethernet card changed? Or that you are using a slightly older MATLAB and your Linux is using the new universal device naming system? 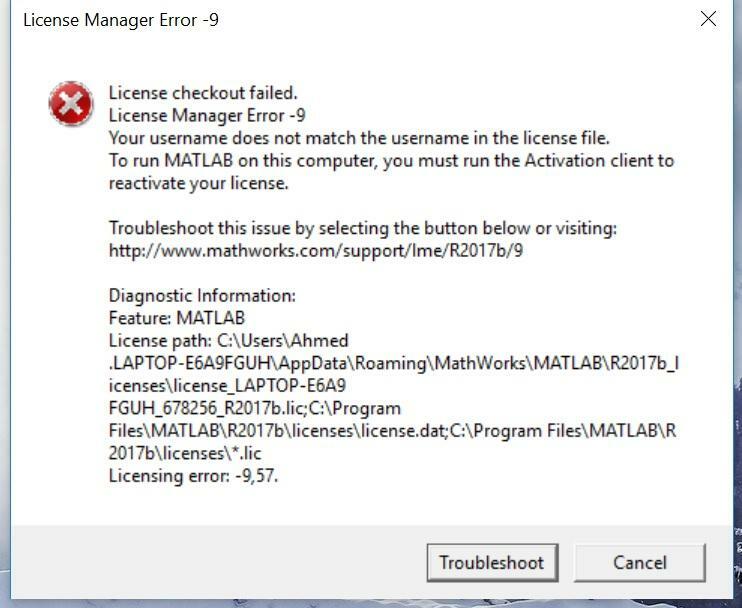 Hi, I can not activate Matlab. It is installed already, but it does not launch, and the link here is not being helpful enough to me so I can activate it. Would you know what can I do? Contact Mathworks for free installation support. Note: if you are using Windows 10, some people have been reporting that MATLAB will not launch for them; I do not happen to recall what the causes of that turned out to be. See also my License Error Cheat Sheet for other causes. Yes @lis coffey -This helped me, as I accidently changed it while activating the license. Thanks! i reactivated the license on the linux machine several times and deactivated the old license for my windows machine online in the mathworks.com license center. Anybody any more suggestions on what i can try? for the user who will be using MATLAB. Do not use root as the name. Note: It's your Windows User Name rather than Microsoft Account Name. 1.While sitting at the host computer with press and hold the Windows key and press the letter R on your keyboard. 2.The Run box will appear. 3.In the box, type cmd and press Enter. The command prompt window will appear. 5.Your current username will be displayed. thank you!!! it's right to open my matlab. I found my windows username...how can I enter it to the program now? See the above on "How do I activate MATLAB?". After you enter your Mathworks account information, you will get a window asking which user name will be used to run the program; enter your windows username at that place. This problem trouble me one day,now I have solved it as you said. Think you very much! The most simple and practical answer! WoW Very Good! Thank you!! if I did this and it says my username is "owner", how can I then change it to match my Matlab username? You help me out! Thank you!!! Thank you very much!!! Finally, I found the correct username and solve the license error problem. This was very helpful and allowed me to solve my activation issue; thanks! Thank you so much!! This is very helpful for me to solve my error 9. Thank you so much!!! This solved my mismatch error! Thank you very much. Very useful answer! If I have taken a wrong Windos User's Name,what should I do? Follow the steps about activating MATLAB in the main Answer. I was able to fix the error on my MacBook Pro with the advise above from Scott on the MathWorks Installation & Licensing Support team. I've added a few tips and step by step clarifications for others that may have the same issue. It seems that you need to know which user on your Mac you are using. To find this out open a terminal window and type "whoami". Copy that result. You will need that at last step of the activation process. I installed MATLAB in the /Applications folder. In the terminal I ran the activation script again by typing "./activate_matlab.sh"
Then open a new finder window go to Applications and try to run MATLAB_R2016b. It opened this time without errors hope this helps. This worked perfectly for me. I recently changed my host name, which gave me the -9 error, and I was able to run MATLAB again after this. This worked for me, except that I needed to run `sudo ./activate_matlab.sh` instead of just `./activate_matlab.sh` to have the necessary permissions to update my licence file. Note for Linux users: when I installed MATLAB on my Manjaro OS, I was required to have 'root' as my username, rather than my actual username. The solution to this (if you're using a terminal, which is the only way I can access MATLAB), is to open MATLAB as 'root' by entering 'sudo su' (which changes you to root), and then typing 'matlab'. P.S. The '' marks on words and phrases like 'root', 'sudo su' and 'matlab' are written in this post just to highlight the specific terms and commands. Quotes ('') should not be included when inputting commands into the Terminal. "No passwd entry for user 'matlab'"
Can someone help me out please? 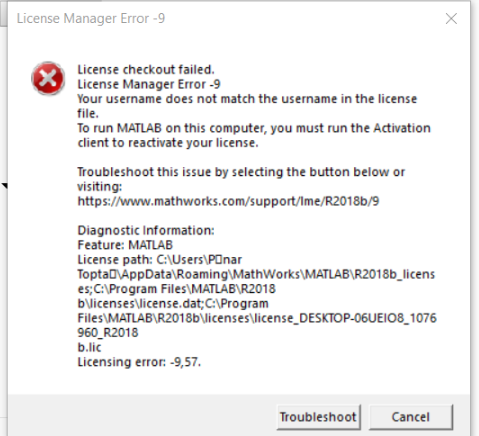 Ok, it works but typing first "sudo su" and then "matlab"
If you are getting License Manager Error -9 unless you run MATLAB with the sudo command, this means that you using MATLAB as the root user, which is not recommended. I would recommend you reactivate MATLAB to your normal user account by running the "activate_matlab.sh" script in the /bin/ directory of your MATLAB installation directory, and providing your standard username when prompted. Thanks this worked, been struggling for a while! This is amazing. Thank you so much. good!! in my ubuntu, username 'root' work correctly!! Don't run matlab as root. It is not necessary at all. 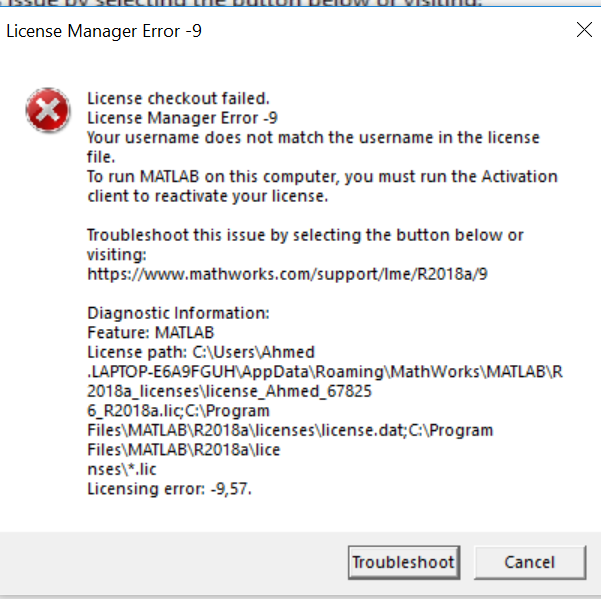 I installed matlab as root but root is not the user of matlab.I got this licensing error recently and to solve that I removed the license file and registered my account again. @Jagannathan Tiruvallur Eachambadi Removing the license and reactivating Matlab worked for me for the same issue. Thanks! For me, it was just needed to run matlab without root privileges. I was trying to run matlab as a root and it was failing. Without 'sudo', it worked fine. Same as "For me, it was just needed to run matlab without root privileges. I was trying to run matlab as a root and it was failing. Without 'sudo', it worked fine." Just deactivate license, reactivate it, input your info but this time use your PC's username which you will find in the command prompt as soon as you open it. Download the license file that is under that username and place it in the correct folder. The path to that folder is given to you when the error window is up. Go that folder first before doing anything. When you find it, there will be a license file already there. If you are an administrator of the PC remove the license and replace it with the new one. And THEN run MATLAB. It should definitely work for the student version for that is what I have. +1 - I did precisely this (Have a B: drive) and it worked fine for my student standalone license. The problem appeared for me on Ubuntu Linux 14.04 today, the error message saying that the hostID of my computer did not match the one in the license file. This was correct, as matlab seems to use the MAC-address of the ethernet controller as the hostID . But somehow (don't know how it happened), my eth0 ethernet device had disappeared , i.e. it was not listed when calling ifconfig -a, lshw showed the ethernet controller as "UNGEFORDERT" and lspci showed the controller, but with no corresponding kernel driver in use (should be e1000e in my case). matlab obviously took the MAC-adress of my wifi-card instead as hostID which did not match the one in the license of course. Rebooting did not bring my eth0 back. 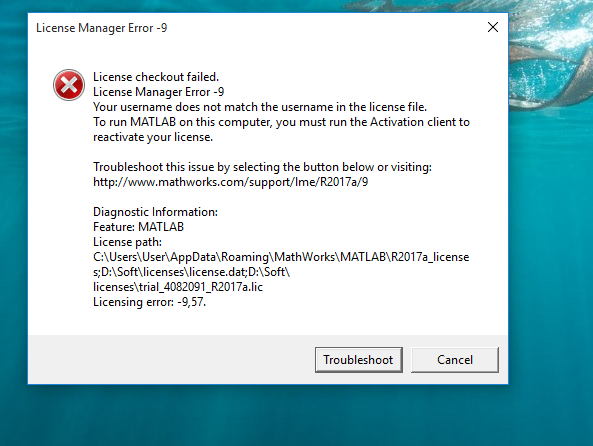 If you are unable to resolve this or any other error, please contact MathWorks support. Installation & Licensing support is free for all MathWorks customers, Professional, Academic and Student alike. Re-enabling the device fixed the problem for me - I was able to start up Matlab with no problems... Hope this helps someone out there. This is what happened when I tried to run MATLAB after installing it on my MAC Book Pro. Hey, I also receive this erro. When sudo ./activate_matlab.sh I follow the prompts and everything seems right. However, when following the steps and using sudo to launch matlab it crashes everytime. On OS-X, you cannot run MATLAB with a Named User license when sudo'd unless you registered root as the name of the authorized user. It would not surprise me if Linux has the same difficulty. I have a student version of MatLab_R2012a_student and it wouldn’t run after upgrading to OS-X El Capitan, I got an error code -9. You might not need to do this as the error from MatLab might give you the Host ID its looking for. Then again you might want to check anyway. The MAC address is the value listed next to "ether". You need this later to get a new license. MatLab should start, well at least it did for me. Had the same issue using Matlab on Ubuntu 16.04 LTS running an academic trial. My user name contains a space. As in it is "lastname firstname". When I try to activate I am told that the user name is invalid. I am assuming this is becasue of the space. If I remove the space to make the username "lastnamefirstname" it activates successfully but I then error 9 when opening Matlab. I can't change my default computer name as it is managed by an administrator and used for other applications in our business. Any suggestions? If following the instructions given in the MathWorks Support Team's Accepted Answer didn't resolve the problem, please contact Support using the Contact Us link in the upper-right corner of this page for one-on-one assistance. I have the same problem. Did you resolve it? if using windows: right click on the desktop icon>> open folder location>> win64 >> click on activate_matlab.exe >> now go through all the login procedures and make sure you enter the same username as your PC's. To know your username type echo %username% on command prompt. I resized my VMWare Windows 10 partition from 30gb to 45gb, and changed the snapshot where Matlab is installed to a clone/separate image. Starting matlab gives me this error. This is because the financial toolbox with IQFeed data provider is not working under Linux so I have to run it under VMware. I want to change the name of user. Re-run the activation. You should not have any problems unless you changed computers, up to a limit of about 4 times per year changing the ID. Having this exact same error.Running the activation again doesn't work and I didn't change machines. Please don't respond if you don't know the answer. There are too many possibilities for us to be able to give an authoritative list of all of the possible causes. Some of the causes are, for example, specific to exactly which update to which operating system you have installed, and to which patches you have installed. The license file was generated as it should and I could use MATLAB after. I guess you could make a link in the launch menu, but this will at least allow you to start working with MATLAB. Running arch linux, for me the activation program failed because the hostid it recovers is wrong. Probably due to different naming of the ethernet adapter. Solution: Manually create the license file using the website. Enter the correct hostid and username + install matlab in your home folder so you can start it without root access. Why do you need to change the HostID? Did you contact the technical support already? See the "Contact Us" link on top of this page. I am still facing the same problem after installing uninstalling the software 22 times. My time is being wasted and I need to practice for my tests. And did you follow the advice already to hit the "Troubleshoot" button or open the given URL? The message means, that the license file contains a user name, which is not "Ahmed". I guess it is the name of the admin of the computer instead. You can find this out by reading the license file - the file name is showed in the error message already. If the other suggestions in this thread still do not solve your problem, contact MathWorks directly using the "Contact Us" link on top of the page. Re-installing a 23rd time will not be useful, obviously. Yes, I did click the troubleshoot button but couldn't find the solution to my problem. I reinstalled the software again but this time, the user name in the license file is different. The error still persists. Please have a look at the attachment. Please try this and if it does not work, contact MathWorks. Why do I receive License Manager Error -9,57? The particular case of -9,57 is almost always username mismatch. I use my student licence on my sister computer(that i use as my own now), so it is a different user. when I installed, I used my old userID instead of my sister's userID. Is that any ways I can change hostID without creating new mathlabID or new userID in my computer? If you are still using the same computer, then the hostID did not change. If you changed login names then the easiest thing to do is to go back to the old login, deactivate MATLAB, then go to the new login and activate MATLAB. Thank you so much. I can use MATLAB now. Hi I continuously get this error code (License Manager Error -9). I am using matlab 2018b. I have a student licence and a university-assigned licence. 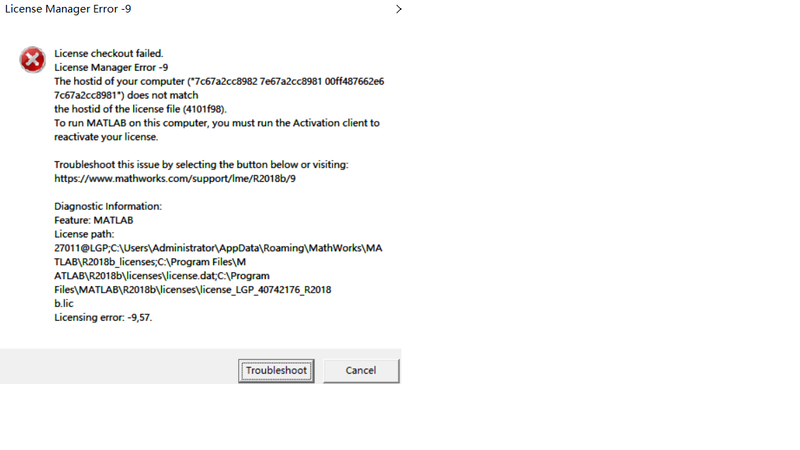 I tried to deactivate matlab and then activate using activation manager (everytime, it is like this: when deactivating, it says my university licence is deacivated and when I activate using the student licence, it says it is successfully activated). But when running a code, it continously generate the error code. Can anyone provide some ideas? Thank you! I downloaded Matlab for a username that contains Turkish characters and now it won't open giving the error below. What should I do? Also, it's my third time downloading Matlab with different usernames in the last month (on different computers). Is there a limit to it? I have a requirement to have matlab to run for 2 users on the same computer. I am happy to pay for the licenses. How can I achieve this? Does it happen to be the case that only one person at a time will need to use MATLAB, and that they will be sitting in front of the computer (not remote access) ? If so then one approach would be to get a single Node Locked license. Any number of people can use such a license, but only one at a time. No remote login, but the first instance will be running when 2nd instance is logged in. Imagine I have a large dataset that needed to be processed, and it will take days. I need the computation to continue and I will log onto another instance and work on other stuff. Any idea would be helpful. When I ran into this error, it was on a computing cluster. The cluster's matlab license had expired. Issue was resolved as soon as they updated their matlab license. I got the same error, I activated the MATLAB again. The issue was resolved for me. I need to install a toolbox support files that require admin privileges. Unfortunately, during the installation, Matlab does not ask for admin credentials. Instead, it throws error of inssuficient privileges and quits the installation. 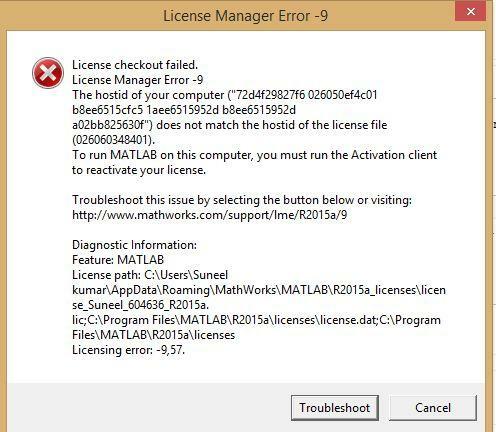 The only solution would be to use my admin account to run the Matlab but it throws error -9. Is there any other way to install that extension on a system with limited privileges? I cannot run Matlab with the admin rights for the same reason. Which operating system are you using? @Jakub: By the way, this is the public forum in which mainly voluntary Matlab users are posting answers. If you want to contact the official support of MathWorks, use the "Contact Us" link on top of this page. If you have the credentials for the admin privileges, you can give your local account admin privileges temporarily also. Do this, install the toolbox and remove the elevated privileges from youir personal account afterwards. If this idea is successful, you will see, that you cannot accept it as a working solution. So prefer to post a question in your own thread, instead of attaching it as a pseudo-answer in another thread. No, it's company policy enfroced. But thank you for pointing out wrong board for asking such questions. I will contact the support.